We all remember chlorophyll, one of the main characters from our 8th grade Biology textbook, the green pigment found in plants and algae that absorbs sunlight for photosynthesis. It’s the veritable lifeblood of plants, resembling, also, the hemoglobin found in human blood. Every time we eat a raw green, vegetable, we also consume nutritious chlorophyll. What many people do not know is that cooking a vegetable will destroy its chlorophyll content along with other important enzymes. Ideally, we should aim to keep our food’s chlorophyll intact because of the numerous benefits it provides. Here are a few of those benefits. Probably the most well-documented benefit of chlorophyll is its powerful combination of antioxidants. A 2013 study published in Food and Nutrition Sciences called chlorophyll compounds “important health-promoting dietary factors which can protect the body through multiple chemical mechanisms.” The study cited that chlorophyll and pheophytins (a chlorophyll molecule lacking a magnesium ion, just FYI) function as antioxidants that help prevent oxidative DNA damage and lipid peroxidation (cell damage caused by free radicals). Chlorophyll is believed to scavenge free radicals and chelate (to bond with and neutralize) reactive ions. Because chlorophyll contains a great deal of antioxidants, it will also help combat chronic inflammation. Chlorophyll has been shown to reduce carcinogen bioavailability and biomarker damage in animals as well as aflatoxin (a fungal toxin that can attach to grains and spices) in human studies. A smaller study, found that chlorophyll might also aid in removal of carcinogens associated with fried-meat products. Since the 1940’s chlorophyll has been used topically on wounds to promote healing, reduce inflammation and is still used for those purposes today. It is believed that chlorophyll slows the growth of some kinds of anaerobic bacteria and, therefore, aids in the healing process. If you were to slap a bunch of chlorophyll under your armpits, you’d wind up with green armpits. However, chlorophyll has been used for over a half-century as a way to control internal odors. It is used topically to dampen fouls smells from wounds. It has also been employed internally to reduce the smell of colostomy bags, urine and feces. A new study on people who suffer from Fish Odor Syndrome– a genetic disease that causes some people to smell like fish–found that 60 mg of chlorophyll daily reduced that smell. 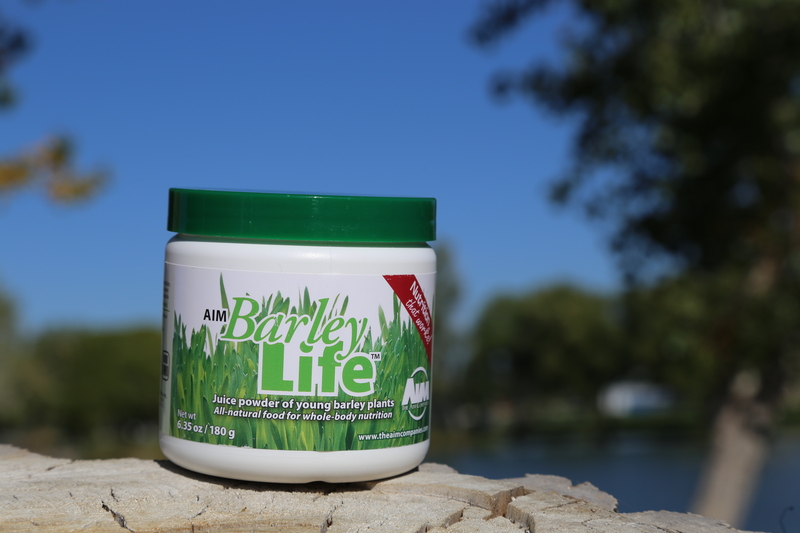 Each 4-gram serving of BarleyLife contains over 19 mg of chlorophyll, and BarleyLife is processed cold, locking in the freshness and nutrition of other chlorophyll and other digestive enzymes one would normally find in a fresh vegetable. As a powder, the nutrients in BarleyLife can be absorbed quickly and more effectively than a garden-variety vegetable. It is also easier to digest and only contains 15 calories per serving. Want to know if AIM’s greens, etc are Non GMO Organic Whole Live Foods? Yes. Only the fiber has been removed. All products are grown under organic or better-than-organic standards. We test all our products for the absence of pesticides, herbicides, fungicides and 25 classes of residual cleaning solvents. Appearance of any of those chemicals with result in rejection. Furthermore, we test for bacteria, heavy metals as well as several nutritional markers. As an international company, we have not applied for USDA certification.